February is here and I am so thankful January is gone. Without boring or burdening any of my readers with details, let’s just fast forward through the month that was anything but a great start to a new year. I’ll simply say far too many things did not go RIGHT in many areas of life for me, some family members, and close friends…but this second month of 2014 has so far started off much better. This. This right here. 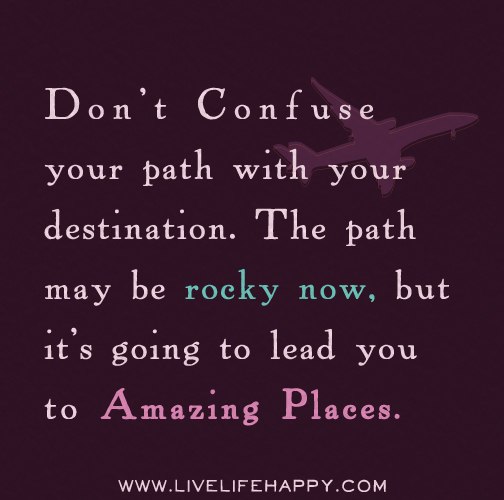 January and all of its events were certainly part of a very rocky path that had me questioning many things in my life. While I wavered in my faith at times and suffered from some serious bouts of discouragement and depression, God remained faithful and gracious. This quote here is also very timely – it is easier said than done, but expresses wisdom nevertheless! I forgot that somewhere along the path. But as the quote above states, whatever paths and detours we stumble through at times are NOT our destinations — they simply lead us, eventually, to our intended destinations. So what’s up along the path for this month? Let’s see: revisiting my goals for the year, celebrating my hubby’s birthday (on the 9th) and our 8th anniversary (on the 11th), blogging/writing more consistently, working on and turning in my COMPS (comprehensive essay exam for my Ed.D. degree), and promoting my freelance and creative businesses. This leads me to a special announcement: I finally have a NEW website for my creative business, K-Lee’s Kreations, thanks to Robyn of Red Robyn Graphics, and I will be participating in a new endeavor set to debut this month, Purple Mountain Dreams. So what about you? How was your January? What are your plans for February? Back on 1-20-14...At Least on the West Coast!<< >>Pardon My Absence--I'm Now ABD! I loved the quotation. That’s the way to live. My novels are all about how to traverse the path and find redemption at the finish. Nobody is without faults–that’s what makes interesting reading. Francene Stanley recently posted..We all live on the edge of disaster. This is a fantastic quote! That’s great that you are ready to start afresh in February and leave January with it’s challenges behind! I’ve gotten myself back on the straight and narrow after failing to plan last month! Tamsin recently posted..Are You Living With Intention? It seems like it’s always going to be SOMETHING. Life is hard no matter what we do. So yes, rising above it all is the solution. Learning that we can still be joyful and thankful when things are tough, because there’s always going to be something that’s tough. Congrats on the new website! Glad things are going better.